APPLECAT ACRES HAS BEEN SPECIALIZING IN TRADITIONAL SIAMESE FOR OVER 15 YEARS. We believe that good nutrition and healthy, vigorous bloodlines are the keys to our successful breeding program. All four colors are available-Seal Point, Chocolate Point, Blue Point and Lilac Point. A long list of references and happy customers augments our well-established reputation. 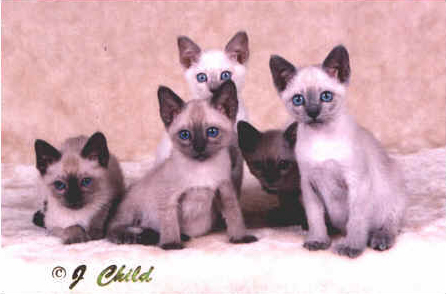 Traditional Siamese and Traditional Balinese Kittens available now for your selection. Good opportunity for breeders as these are from old established bloodlines in all four colors. Our kittens are not shipped alone. We invite new owners to fly with their new kitten in the cab of the airplane. New Owners may contact me by phone or mail and come to pick out their kitten. We have mostly Seal Points, but one litter of Blue Points and one litter of Lilac Points are available once a year. Kittens are raised with great care, and are unafraid of people and sweepers. We are located 30 miles West of Harrisburg, PA., and situated in farm country half way between Carlisle and Shippensburg, PA. Currently our two stud males are Bucky and Lord Darby. Our three breeding Queens are Annie, Daisy and Molly. Please enjoy this introduction to our Traditional Siamese family. ALL RIGHTS RESERVED © by Applecat Acres and John & Diana Fineran - Aug 1999- 2019.